In September 2007, following over 40 years sailing, and looking for another challenge, I arrived at Wycombe Air Park having considered the possibility of signing up for a PPL course. However, seeing the gliders on the field and recalling my early solo flights with the Air Training Corps some 50 years earlier, I ended up signing on for an intensive gliding course with Booker Gliding Centre. I went solo in January 2008 and shortly after gained my Bronze badge and cross-country endorsement. Almost at the same time I took on and redesigned the Booker GC web site www.bookergliding.co.uk when I became aware that the web page titled ‘History’ contained only a brief history of Wycombe Air Park with no mention of gliding activities at all. This prompted me to try and capture what knowledge, was available on the history of gliding at WAP (mainly from peoples’ recollections) before it was lost for ever. This small article is the result. A Brief history of Wycombe Air Park by Barry Abraham follows this article. The airfield, originally known as Marlow Airport, was requisitioned by the Air Ministry in 1939 and opened in 1941 as RAF Booker and in 1965 was developed as the civilian aerodrome under the name ‘Wycombe Air Park’. The airfield has featured in a number of films. In 1965 it was used for the making of ‘Those Magnificent Men in Their Flying Machines’ and in 1975 it featured in ‘Aces High’. It has since been the backdrop to many a film sequence and advertisement. 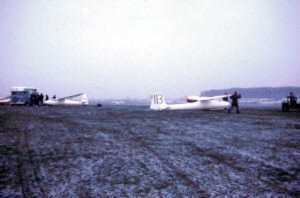 The airfield was associated with gliding even before a gliding club was established. Commencing in 1942, officers and men of the embryo Glider Pilot Regiment were trained to fly light aircraft at the Elementary Flying Training School at RAF Booker. From here they went on to RAF Croughton for convertion to gliders – flying the all wood Hotspur low wing monoplane. Conversion to the heavier Horsa, used during the D-Day landings (and the famous raid on the Pegasus bridge), took place at RAF Brize Norton. Though the airfield now goes under the name of Wycombe Air Park, it is know both locally and nationally as simply ‘Booker’ and for the sake of brevity I will use Booker throughout the rest of his article. No history of gliding at Booker would be complete without mentioning two people who were prime movers in the change of the airfield from its use by the RAF Bomber Command to a gliding centre, and these are Peter Ross and Peter Hearne (Vice President BGA). The establishment of a Gliding Club was the end of a saga that started when Peter Hearne joined BOAC Operations Development Unit from Cranfield in 1949. Although he had been the Assistant CFI of the College of Aeronautics club, he was more anxious to improve his flying skills and experience in a professional environment than to continue to struggle with the shortages, which affected so many UK gliding clubs in the early 1950s. Consequently Peter complemented his day job, which involved quite a bit of development flight test and overseas proving flights, with part time work as an assistant flying instructor at the Airways Aero Club, then operating at Denham, and also Bristol (Whitchurch). Around 1953 the operation moved to Croydon and there was a lot of emphasis on preparing navigators and radio officers for retraining with a CPL and Instrument rating. However the gliding bug in him was not dead, but only sleeping, and he began trying to set up a ‘Speedbird Gliding Club’. A chicken and egg situation arose as the unavailability of a site discouraged BOAC’s central sports organisation from allocating any funds to the embryonic club and likewise the absence of funds prevented any real progress in establishing a club on a site. In 1954 Peter was transferred and promoted to head up the experimental flying and engineering operations of BEA’s Helicopter Unit and two favourable developments occurred. The first was that of the two people interviewing him for the job, one was Peter Brooks. Ex FAA pilot and now the BEA Chairman’s special assistant. He was also a keen member of the Surrey Gliding Club. Also in BEA was Ken Wilkinson, a pre war Silver C and former Imperial College club member whom Peter had previously met several times due to his friendship with Alan Yates, his tutor at Cranfield and also incidentally the Cranfield Gliding Club Chairman. Ken was movingly rapidly up the BEA hierarchy (He retired as Managing Director of British Airways) and Peter Brooks had the trust of the Chairman, so all of a sudden Peter was swimming in a much more friendly sea. The other, and most certainly the most effective and decisive factor, was the arrival in BEA of Peter Ross. Peter Ross, an ex De Havilland apprentice had just finished his two year National Service as an RAF Engineering officer and whilst holding down a job in an aircraft company drawing office was very much involved part time with Colin Chapman, Frank Costin and one or two other aeronautical engineers who were the totality of the original engineering team planning and designing the successive models of the Lotus sports car kits and later GP cars. All of a sudden there was enough critical mass, and senior management support, to believe that it may now be possible to get a gliding club up and running, provided a site could be found. The announcement that Bomber Command were closing down their communications flight at Booker presented a possible solution. Whilst instructing at Denham, Peter Hearne had visited Booker once or twice and knew that it was a good choice as a gliding site. But how to get it? Thanks to Peter Ross’s initiative and the perception of the BEA Sports Club Manager (known as The Silver Wing Club) there appeared to be some very high level support. An embryonic club committee managed to set up an arrangement whereby members joining Dunstable or Lasham would have a percentage of both their subscription and flying fees subsidised by BEA. This was a good start and provided a group of semi-trained pilots from which the club's own operations could grow once they were established. At this point the ‘committee’ persuaded a somewhat reluctant sports club manager to write to the Air Ministry saying that BEA in the form of their Silver Wing Gliding Club would like to take out a lease for the use of Booker airfield for gliding operations. The reply, when it came, was the classic good news/bad news story. “Yes, we could have the lease that we asked for BUT the Price was £2000 per annum. "—a quite impossibly high sum for a gliding club in 1957. The Chairman of BEA, Peter Brooks’ boss was Marshal of the Royal Air Force Lord Sholto Douglas, a distinguished RAF war time commander with a heavy weight reputation. The Air Officer Commanding in Chief of Bomber Command who ‘owned’ Booker was Air Chief Marshal Sir Harry Broadhurst an even more distinguished RAF war time commander—though not quite as senior and also of a heavyweight and fiery temperament. ACM SHB "Leave it with me Sholto”. And very shortly in 1957 there followed a letter from the Air Ministry, which offered the lease at a very much reduced rent, and so Booker started to evolve. There was of course much more to do. As Peter Hearne left the airlines at about this time the workload fell on Peter Ross and the committee who as can be see today, laid the foundations for one of the UK’s leading gliding clubs. There is no doubt that it was Peter Ross’s enthusiasm, energy and leadership which was the key element in causing this to happen. 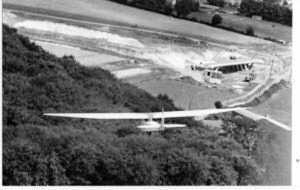 So the earliest record of actual gliders being flown at Booker was the establishment of the Silver Wings Gliding Club for BEA and BOAC employees in 1957. The club operated a T21b and a Tutor as a solo aircraft and in 1961, they acquired the Olympia 2b, followed by a Ka7 and a Swallow in March 1962. The number of launches undertaken in 1964, 3437 as recorded in the April ’65 S & G rising to over 12000 in 1967 is indicative of the rapid increase in club activity. 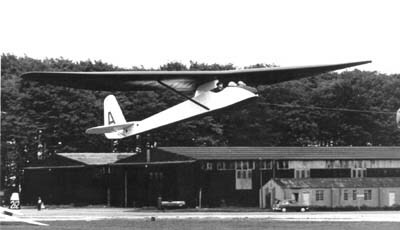 Silver Wings Gliding Club was renamed the Airways Flying Club (gliding) in 1965. Once gliding had bees established it was decided to invite the powered arm of the Airways Flying Club to move to Booker from White Waltham and by mid ’65 both gliding and powered flying was well established at Booker. 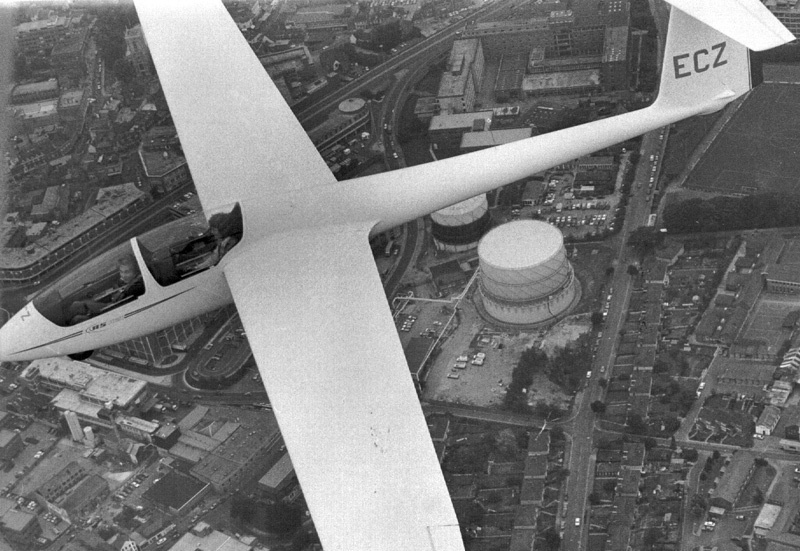 Another club formed at Booker in 1965 was the Thames Valley Gliding Club formed by a bunch of enthusiasts, led by Dr. Brennig James. Others present included Bill Breakspear (treasurer), Eric ‘Bungey’ Baker and John Mathieson (secretary). One member, Dudley Steyner, eventually became the chairman a year later. The insert shows a short article from the local press (date unknown). It incorrectly states the meeting was in the George and Dragon in Marlow, but in fact it took place in the Chequers pub. A couple of names were also miss-spelt. As planned, early gliding instruction of members did in fact take place at Lasham, today possibly the UK's largest gliding club located near Alton, Hampshire. Five glider pilots, with unbound enthusiasm for the sport out­lined their plans for the formation of the Thames Valley Gliding Club at the club’s inaugural meeting at the George and Dragon Hotel. Marlow on Tuesday. They were the club’s first committee. Dr. James told prospective members that most clubs experience great difficulty in obtaining sites and only three or four of the clubs in this country have security of tenure. A monthly Newsletter is to be issues and a series of lectures on gliding have been arranged. Members will be able to spend a week at Lasham – another gliding club – for instruction, later in the year. The newly formed club now has about 50 members but in order to raise the finance necessary to receive the backing of educational and other authorities, many more will be needed. Officers: Chairman Dr. Brenning James; Secretary John Matheson; Treasurer H.F. Breakspear; Membership Secretary Eric Baker; Chief Flying Instructor Stuart Fursan. Brennig James was, reportedly, the first person to fly a 500K and at one time held the record for the most 750s flown. This old newspaper picture shows the Skylark 3G. 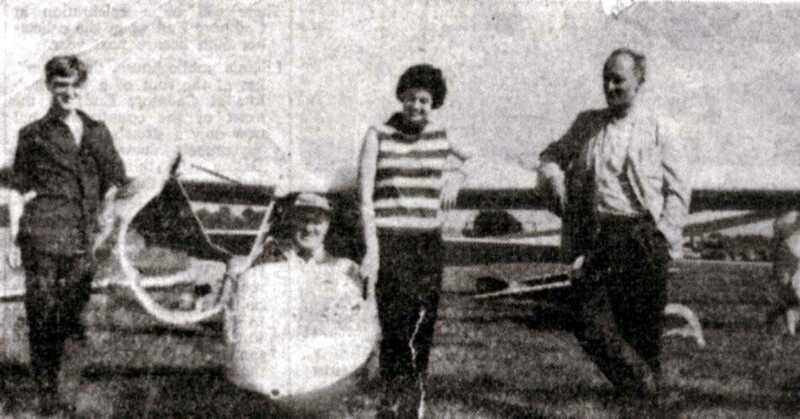 From left to right are Andy Baker (then 17), 'Bungy' Baker in the cockpit; Erica Scurr and Dr. Bryan Latymer. Dr. Brennig James was a partner in a group practice in Marlow. One of the people he introduced into gliding was Harold Fletcher who owned a photographic shop in Marlow high street. Harold reports he 'nearly lived in George Scarborough`s Pocket getting A.B.C. and Bronze in very short order. 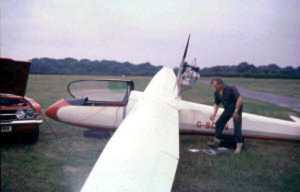 George Scarborough was CFI of Thames Valley Gliding Club. After achieving his 'Silver C' Harold went on to become an instructor; finally CFI. 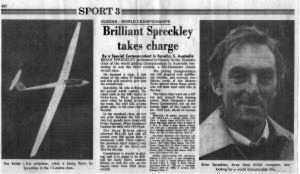 He became the Manager of Thames Valley gliding club at the request of Bill Breakspear. Having a PPL Harold also did over 300hours aero-towing. (aero-towing took over from winching due to the introduction of power-flying at Booker). While still a student pilot, Harold thinks he was the last to take a winch launch in a T21 at Booker, with George Scarborough in the back. Harold was to hand over CFI duties to Vera Waites - the first woman to hold this post. Vera also helped out with office duties. 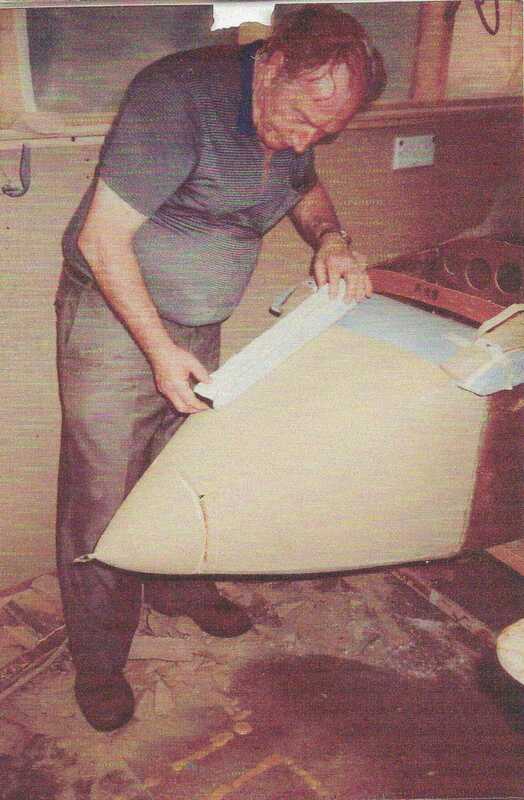 Harold also achieved some notoriety by building a Long Eze plane from scratch in his garage. An article from the Advertiser 1985 covering this achievement is to be found at the end of this article - here. This is only one of his many achievements - but sadly these are not relevant to this article. 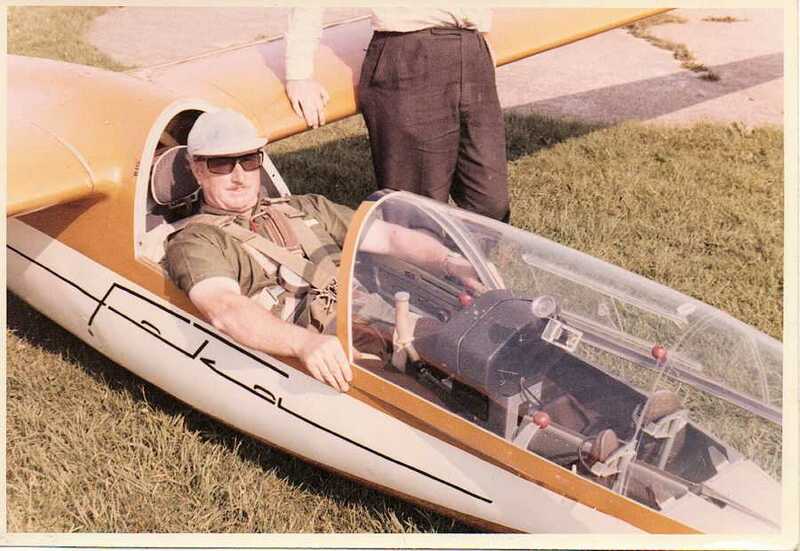 The photo below shows Harold in his Foka 3 - a modern looking glider for that time. 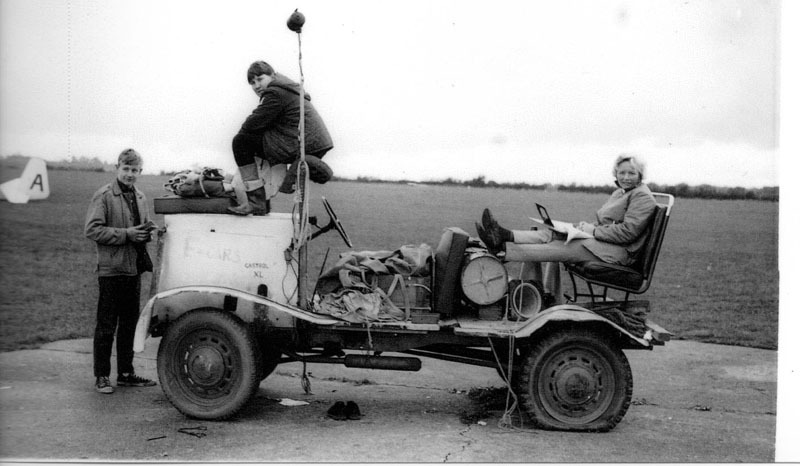 The Foka (an importer's demonstrator) was originally purchased by John Sangster in March of 1964. 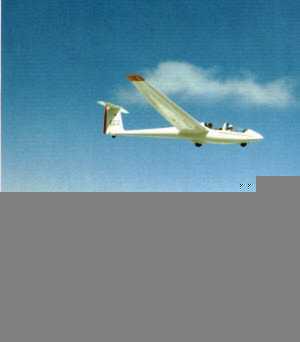 John started gliding at Booker as a member of the Silver Wings Gliding Club in 1960, becoming an instructor in 1963. John sold the Foka to a syndicate in October of that year prior to moving to Aberdeen. It was from that Syndicate that Harold Fletcher acquired it. (More pictures of this glider are to be found here). It was later sold to Jim Platt (Marlow garage owner) and John Rouse and re-sprayed a different colour. At the time of writing, Harold, now 93 is living in Spain. The following announcement was posted under Club News in the December/January 1966 edition of ‘Sailplane & Gliding’ – the first report of many about gliding at Booker. A new light Aviation Centre has been formed at the Old Booker Airfield near High Wycombe. known as Wycombe Air Park. Its purpose is to further gliding and light power flying. At present the gliding consists of the Airways Flying Club (joint RE.A / B.O.AC). the Post Office Flying and the Thames Valley Gliding Clubs. All training is done by the Centre which operates two T-21s. a Ka-7 and two Swallows. The training gliders are owned by the A.F.C. except for one of the Swallows which has been provided by ­CISAVIA, the parent body of the P.O.F.C. High-Performance gliders are the responsibility of individual clubs or private owners. The power side training is also operated by the A.F.C and there are facilities for private owners. The airfield is subject to Prior Permission Only for powered aircraft but not ­for gliders. Opposite direction circuits are in force, and gliders should fly the opposite circuit to that indicated by the signals square. We welcome any visiting pilots, but would request a sharp look-out. Landing fees will not be charged for tugs retrieving gliders from cross-country landings. In the fairly near future, tea – and other comforts - will be available. The Airpark Manager is Pat Pattison and the telephone number after December 11th is High Wycombe 29261. The Post Office Gliding Club was the next to be formed at Booker; Dave Brett and Geoff Symonds being instrumental in getting the club started. The club consisted of only 12 members and one glider, an Olympus 2. This glider was originally hung from the ceiling of the Dome of Discovery, part of the 1951 Festival of Britain. After the festival it went into storage for some years before being purchased by the Post Office for use at Booker. CICAVIA (Civil Service Aviation Association Limited) was incorporated in July 1964 as the governing body for all forms of sporting aviation within the Civil Service. It was a member of the BGA. It’s initial purchases to get gliding started was a Beagle terrier with glider towing hook and a medium performance two-seater glider. At the AGM of CICAVIA held in November 1964 it was decided to form a London & District Civil Service Aero Club which would be part of the consortium of clubs at ‘Wycombe Gliding Centre’. This was for civil servants who were not eligible to join the Post Office Flying Club. These two clubs did not last long (around 5 years) before the amalgamation of all clubs took place under the name of Booker Gliding Club. The old hangers (now replaced) including the current Belman hanger. Information on the gliding activities between 1965 and 1968 is hard to come by as little seems to have been recorded and what is known now comes mainly from the fading memories of members. 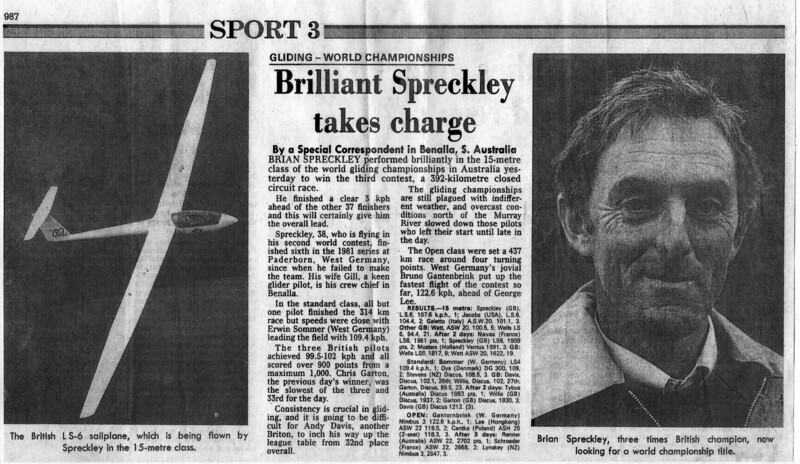 However, trawling through old copies of Sailplane and Gliding I came across news of inter-club rivalry between Booker and Swindon Gliding Clubs for the Wycombe/Swindon Cup. This was claimed by a glider taking of from one club and landing at the other. The competition for holding on to the cup can be judged from this extract from the Thames Valley GC report in the August 1969 S&G. Ian Hobday became Chairman of the Thames Valley Gliding Club in 1969 and Graham Saw, the current aerobatics tutor, took on the role of technical officer with Tony Hayes as the CFI. In 1970 the CFI, Norman Smith, was assisted by two course instructors Chris Rollings and Dennis Neville. Chris was to set the single-seater record for a 750k task in his Jantar, starting and ending at Booker in 1985. In 1990 he was to repeat the same task but setting the first 750k record in a two-seater, ASH 25 (Basil Fairston, the manager of BGC at that time, was in the rear seat). 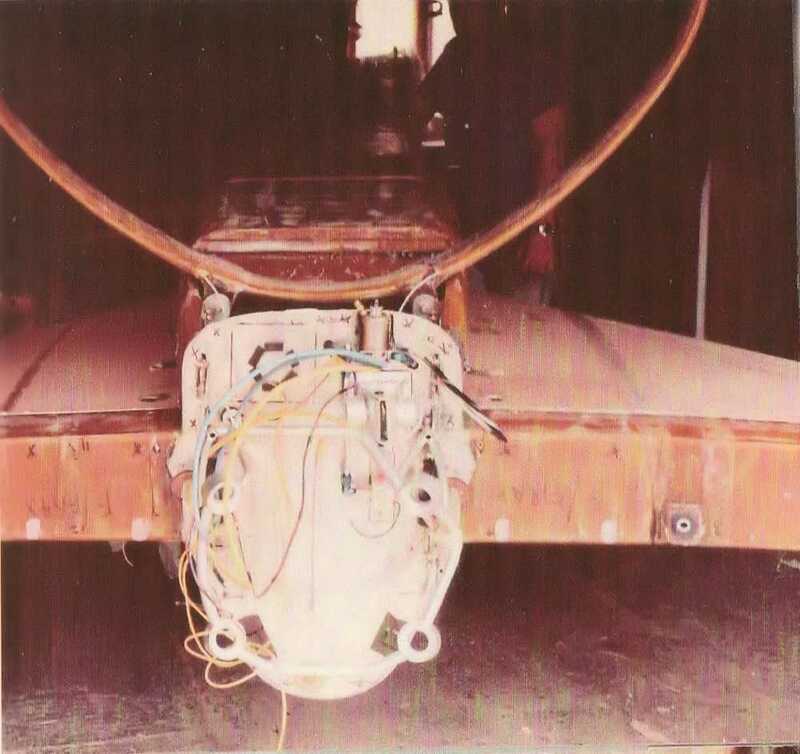 The very first launch point vehicle. The lady keeping the log was member Peggy Belbin and the member standing in front was Doug Clark. 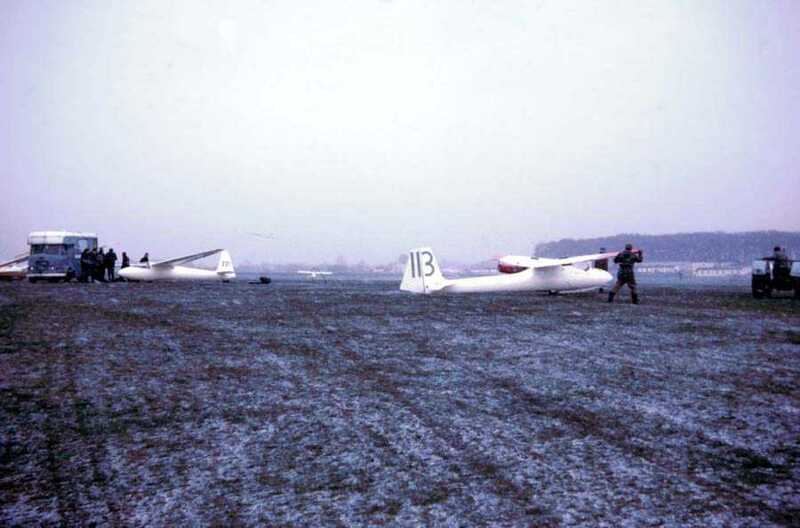 In 1973 the Thames Valley Gliding Club and the Airways Flying Club (gliding) combined their operations with one set of regulations under the auspices of the ‘Wycombe Gliding School’ for administrative purposes only. There was one CFI, Chris Rollings with Dennis Neville and Verdun Luck as Deputies. In 1974 Alistair Kay took over as Chairman and remained so after the clubs combined – see later. The club hut at that time was a long blue wooded building (replacing a brown hut where Wycombe Air Centre now stands). It was positioned lengthways where the car park is now situated and would have been aligned with the restaurant (although the restaurant was built many years later). The launch point vehicle was an old ice-cream van, seen in this early picture, replaced over the years by various single and double-decker buses. Charges for flying in 1974 are shown in the here. Booker GC has always had a very strong cross-country ethos with its pilots achieving significant success at National and International levels. At various periods, over 60% of the British Gliding Team were Booker pilots. In the following paragraphs, occasional mention will be made of records broken by Booker glider pilots. This is in no way a comprehensive list, as their achievements are far too many to mention. Also at the club at this time was a lady, Gillian, who he later married. Gillian Spreckley went on to win the 15m Class in Lithuania in 2001 and in 2007 the Club Class in France. Brian and Gillian left Booker to set up the European Soaring Club http://www.soaringclub.com/ . He was replaced by Basil Fairston, who, due to family commitments, only stayed until late 1990. The first chairman of Booker Gliding Club was Alistair Kay. 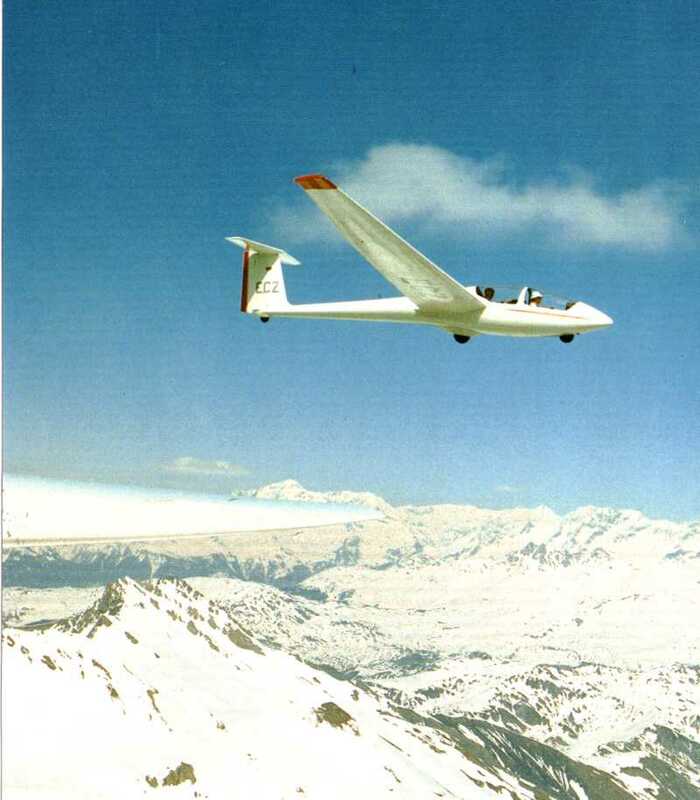 In February 1979, Gerry Leech (current cat 1 instructor) produced the first Booker Gliding Newsletter. The newsletter is still going strong today although it has changed in format through the years. Familiar names of some current members figured in the first edition, namely Graham Saw (ex-national aerobatics champion and current club instructor) and Bob Davey (current Tug Master). All Newsletters from 1999 are available in the archive on the Booker web site. In 1989 two members, Bill Waller and Graham McAndrew (club CFI) set the UK record for the 'UK Multi-seater gain of height' of 27,392 feet in the club K21 (ECZ) at Aboyne. Unfortunately this record did not last long as in 1990, two other club members Alister Kay and Kevin Wilson climbed to over 36.000 feet in the ASH 25. 1990 Basil Fairston replaced by Derek Godfrey as Manager and Graham McAndrew was replaced by Alex Evens as CFI. Aug 1991 saw the establishment of Air Traffic Control at Booker. In the January of this year, Derek Godfrey was appointed manager replacing Basil Fairston and Alex Evans took over as CFI. In the Newsletter of April 1992, it was interesting to read that our current K21 ECZ (then 12 years old) had done 7800 launches, 3027 hours, flown in the Alps, Pyrenees and Scottish Highlands on expeditions, as well as providing basic training at Booker 7 days a week. Looking at the glider today one is struck by how good it looks and it would be interesting to know the latest statistics. Bernie Morris took over as club Chairman in October 1991; having been Chairman of the BGA Instructors’ Committee. In February of 1993, Julie Angell took over as the CFI of the club. Julie was the second lady in this post, following Vera Wates a previous CFI. Julie was obviously a sportswoman, as she had been a sailing instructor and member of the RYA Olympic squad. She also competed in the International 505 class and found time to help deliver yachts across the Atlantic, before turning to gliding. The current Cadet Scheme was started in 1993 with the aim of enabling young people to learn to fly, at a very low cost, and provide an enhanced ground training, mentoring and flying programme. To join the scheme they have to be between 15 and 21 years of age and in full time education. As well as learning to fly, cadets also have the opportunity to gain experience in many other aspects of gliding club operations; everything from managing the start line for a competition, to briefing new members and course attendees. The scheme has opened the door to a number of flying scholarship programs and has helped many cadets progress to successful flying careers. In 1994, the teaching of aerobatics commenced at Booker under Graham Saw – a member with significant success in aerobatics at National level. Graham (and Alun Jenkins) still run annual courses in aerobatics at BGC. Absolute Altitude (1995) – 11,570m: Chris Rollings in a DG 500. The P2 was Briony Hicks, a lady glider pilot and tuggie who went along for the ride. Gain of height (1995) – 10,545m: Chris Rollings & Briony Hicks in a DG 500. The records were set on the last day of an expedition to Aboyne. It was an awesome day and the rest of the group were not allowed to fly at the time due to the very rough conditions. !995 was also marked by Booker finances being swollen by a substantial VAT windfall. (£159,000) as the club was recognised as a CASC by the Inland Revenue. The BGA introduced the X-Country Endorsement to the Bronze Badge in Feb 1996. January 1996 saw the demise of the Newsletter format that had survived for seven years becoming the Booker Information Sheet. Gone were the articles of members’ exploits and expedition reports. It was now a much slimmed down formal periodical. Petrol driven golf buggies appeared this year for the first time. 1997 saw the replacement (i.e. current) ATC control tower was built in 1997. April 1997 Bernie Morris (Chairman) was replaced by Tony Marlow. Moving on to 1999 saw Booker hosting the 18m Championships. Graham Saw again secured first place in the intermediate class of the National Aerobatic Championships flying his Lunak in the October. In late October, the old hangers (shown in the earlier photograph of the T21 being cable launched) were demolished and replaced in March 2000, by the hangars used today and in November the Booker GC web site (developed by Alan Smith) first appeared. The club replaced the golf buggies with the ones in current use in the April. The club has run expeditions for a number of years. Perhaps the most distant one was to South Africa in Nov 2000. September 2002 saw the retirement of Dave Byass as chairman for the past 4 years to be replaced by Bruce Cooper. In October a working group set up to look in to the costs of replacing the existing club house which needed considerable repair work, with a temporary building of the log cabin or portacabin type building in the trailer park. Dec 2003 - Dave Byass became the chairman once again as a temporary measure. Sept 2005 - CFI – Matt Cook was replaced by Andy Henderson. The club decided to sell one of the 5 tugs. Discus 316 and possibly the K21 to realise additional funds. In April 2006 – Roland Wales became the club chairman. In July – a surplus Pawnee was sold. In August - Tim Scott won the 15m Nationals. In fact Booker swept the board with six of our pilots in the top ten with Tim Scott 1st, Paul Brice 5th, Dave Watt 6th, Matt Cook 7th, Bruce Cooper 9th and Wayne Aspland 10th. Paul Brice came second in the 18m nationals with Dave Watt 4th and Rich Hood 7th. In October 2006 – Gary Nutall took on the editorship of the Newsletter and web site. In need of further funds, the club put the K8 DHA up for sale. In 2006 a number of Yahoo Forums were set up to encourage communication between members. December 2006 – the post of full time CFI filled by Andy Handerson, was abandoned and Andy Perkins was appointed as ‘unpaid’ CFI. Andy had three diamonds at 21 and he was the youngest-ever BGA regional examiner at 22. Andy started flying with the Upward Bound trust, which was founded by members of the Glider Pilot Regiment after WW2 to teach 16-21 year olds to fly. (He had his first flight in a T21 with his Mum and Dad, at three years of age). Andy had a long association with Booker GC working as a course instructor during his gap year. Mike Collett remained the DCFI. Mike Collett secured a place on the British Juniors Team representing Great Britain at the World Gliding Championships in Rueti, Italy in 2007. May 2007 saw students from the HND TV production course at Amersham and Wycombe College on site to produce a DVD of a trial lesson as part of their coursework. The final DVD was offered to BGC and can be seen on the Web Site. It is also on offer at various Sales and Marketing events. Booker pilots were once again outstanding in competitions. In Aerobatics, Emily Todd won the Standard Class at the British Glider Nationals and Graham Saw came second in the Intermediate class. Mike Collett was a member of the Great Britain team at Junior World championships in Riete where he came 24th (marred by technical difficulties). In September he won the UK Junior National championships at Tibenham. In January Ban Flewett came second in the FAI World Gliding Grand Prix in New Zealand and Graham Saw was awarded the British Aerobatic Association Glider Trophy for 2007. In 2008 Mike Collett was appointed CFI. Club is registered as a Community Amateur Sports Club (CASC), which has charitable status, and registered with Companies House as Booker Gliding Club Ltd. It is managed by a committee, the members of which are listed in Who's Who on the Booker web site. There are many members who carry out vital tasks in support of training and other club activities. These are also to be found on the Who’s Who page. Over the years members have participated in expeditions to various locations in Europe and beyond. In 2000 members took the duo discus to Ontur (near Alicante) in Spain. Members also shipped gliders to Mafeking South Africa. Booker gliding club can only survive through a strong membership, and one way of ensuring a continual flow of new members is through an extensive programme of training courses. Details of these are also to be found on the Booker web site. Late '70s Ka 8, Jantar 1, Astir Jeans, Twin Astir. Terrier (150 hp) converted Auster with Lycombing, built by BEA apprentices. In writing this brief history of the BGC, I am indebted to a number of members (past and present) for their help in providing information, either in the form of old Newsletters, articles or their recollections of the past. In particular I would like to thank Peter Hearne Vice President BGA for his detailed contribution on the transition of the airfield from an RAF site to one dedicated to gliding. Also I thank Gerry Leech for loaning me every Newsletter from issues 1, and a number of old slides that I have posted on the album page of the BGC web site and Andy Baker and Harold Fletcher for supplying me with information and some unique photographs from the early years of gliding at the Wycombe Air Centre. The following charges are current as from the above date which is the beginning of the Thames Valley Gliding Clubs, (T.V.G.C), financial year, but it should be noted that the launch and soaring charges are subject to revision during the year. A full member is automatically a member of the Wycombe Gliding School, (W.G.S), and is entitled to use the Clubhouse bar facilities. The following charges are for basic guidance only to persons who may wish to join the club, and are quoted inclusive of V.A.T. Further and more comprehensive and updated details are available from the Gliding Office at Wycombe Air Park. Annual subscription £10.00, and subject to individual written appli­cation and approval by the T.V.G.C. Committee. A scheme is available to approved Universities and Colleges sporting unions or associations for Group block membership. The scheme is open on a yearly basis only, and as with admission, is operated entirely at the discretion of the T.V.G.C. Committee. Further details may be obtained by applying to “The Chairman, T.V.G.C.”, Wycombe Air Park, Booker, Marlow, Bucks. and for each additional 200’ a charge of 3Op. The article was written by the daughter of Peggy, his partner, when a cub on the Maidenhead Advertiser. IMPOSSIBLE is not a word which figures prominently in the vocabulary of a 60 year old Marlow Bottom man. Mr. Fletcher started the project only with plans, sent from America and designed by Burt Buten, who has ensured that homebuilt aircraft have really taken off on the other side of the Atlantic. The plane which has caught Mr. Fletcher's imagination is the Long-F7, which goes back to the original Wright configura­tion of the early Canard design with the engine at the rear. The two-seater plane is both fast and efficient and holds the world re­cord for 5,000 miles non­stop flying. “The average light plane does 120 m.p.h. 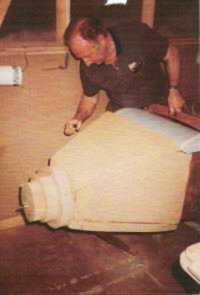 and uses about 8-10 gallons an hour to do it,” ex­plained Mr. Fletcher, “But this will fly at 200 m.p.h. for about four gallons. So it is cheaper than motor­ing!" The idea of building the plane stemmed from a conversation with a business associate who had always wanted to build a plane but did not have the time. “I had always wanted to build a plane but hadn’t got the money so we both got together and this is the result” Mr. Fletcher told the Advertiser. His first task was to build a workshop, measuring just 8 ft. by 20 ft., at his Marlow Bottom home. It had to be properly insu­lated and heated en­sure the right conditions for the complex processes to follow. “It was a month's work just making up all the bits and pieces before I could even start building, as we are not geared up at all to homebuilding in this country” continued Mr. Fletcher. His basic material was foam, cut from blocks using templates and then joined together before fibre-glassing. During the building process the mand the humidity regulated to etal parts, which also have to be specially made, are incorporated and the foam carved into shape by hand. But the most impres­sive work lies in the highly sophisticated instru­mentation, which enables the plane to land at any airport in the world. Mr. Fletcher designed the instrument panel, which includes a VOR — a piece of equipment whichfinds direction anywhere in the world from beacons whichsend out signals. With a glass-fibre plane radar reflection can be difficult, so it ha s a transponder which reacts to signals sent out by radar at airports and sends out signals giving information about the plane. Also unusual in a small aircraft is an independent landing system, a great advantage in had weather. It is equipped with four navigation and communication units, as well as the more usual instru­mentation. The whole system is computerised and voice operated. The aircraft is powered by a Cessna Lycoming 235, rescued from a plane which crashed in the sea and to­tally rebuilt by Ted Moslin at Henley. It is now a zero-rated engine, with some 2,000hours of flying ahead of it. Throughout the pro­ject, the work has been closely monitored and certified by a Popular Flying Association Inspector, who is registered with the Civil Aviation Authority. The aircraft has now been painted and sprayed, and the final touches are being added this week. These include a logo and name G. LUKE, after the son of the business asso­ciate who funded the pro­ject. The complicated task of working out the centre of gravity, the weight the plane can carry and so on will be next on the sched­ule. “Within the next week we are hoping to fly it for the first time from Booker where it will be kept” said Mr. Fetcher. Although he flew and parachuted with the Royal Engineers during the war, it was not until relatively late in his life that he became fascinated by flight. He began gliding only about 20 years ago, but rapidly gained experience and qualifications. He became chief instructor at the Booker gliding club and manager of the gliding section, his expertise being featured later in films like the Magnificent Men in their Flying Ma­chines and the Blue Max. But Harold Fletcher is an extraordinary man and the Long-EZ project is not the first he has attempted that others would think impossible. After the war, he worked as a freelance photographer both in Fleet St and locally. He set up his own business in Mar­low, H. W. Fletcher Pho­tography, and designed and built all the printing equipment. Some 10 years ago he moved to Cornwall, where he built his own house. 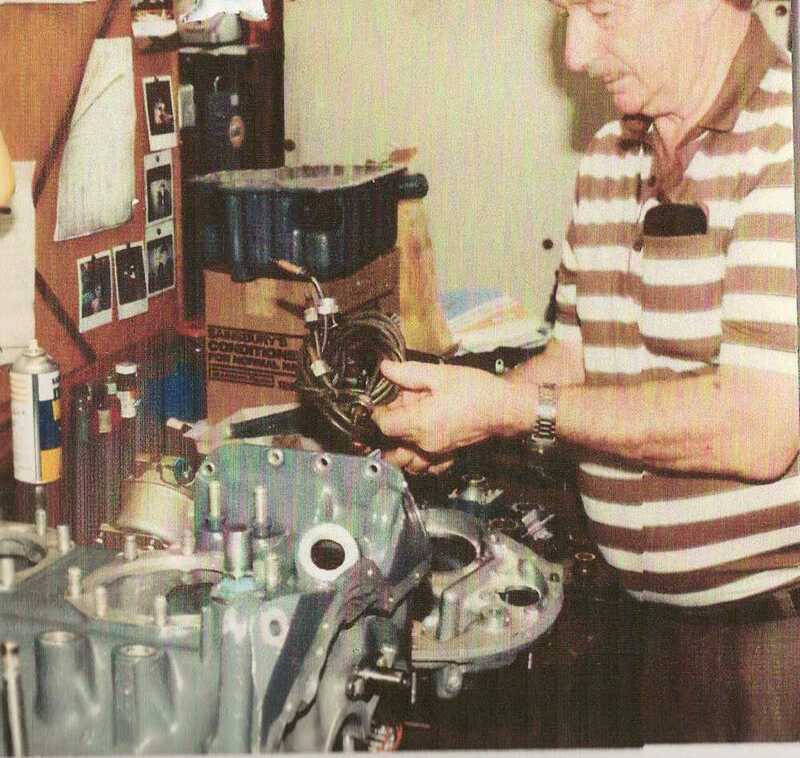 “I did the garage first to find out how to do it,” he laughed. And on returning to Marlow, he designed and built his home in Marlow Bottom. A member of Marlow Town Band, he had al­ways been interested in music but was unable to play a keyboard. “I bought a small cheap organ and was so dissatisfied I started alter­ing it. I then found where I could get the material to build organs and built my­self one” he explained. With his experience as an electronics engineer, his hobby snowballed, the last and most complicated organ incorporating five computers. There seems to be no holding Mr. Fletcher back, and it is unlikely he will rest on his laurels with the completion of the Long­EZ. “There is talk about building a four-seater twin-engine plane. 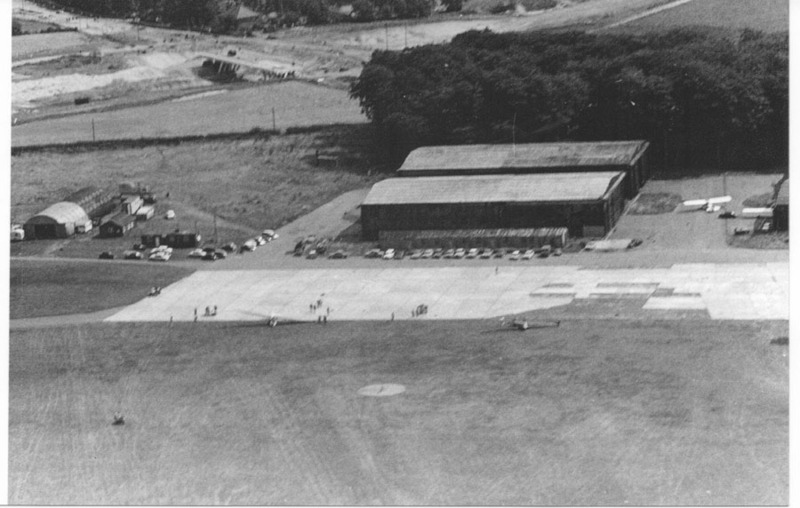 In July 1939 plans were approved by the local authority to build an aerodrome (airfield was then North American terminology) on high ground to the south west of High Wycombe. With thoughts of an impending war already to the fore, the intention was for the airfield to be used for Royal Air Force Volunteer Reserve training and there is no record of any pre-war civilian use. The RAF had decided back in 1934 that its own flying training schools would concentrate on advanced training and that elementary training of pupil pilots would be carried out by civilian schools. Number 1 Elementary and Reserve Flying Training School was operated at Hatfield aerodrome by the De Havilland Aircraft Company. Among a number of other similar schools was Number 50 ERFTS, operated at Booker by Wetton Aviation Limited flying Tiger Moths, Hawker Audax and Hawker Hinds. On the outbreak of war on 3 September 1939, the Booker school, in common with all civilian operated schools, was closed down. 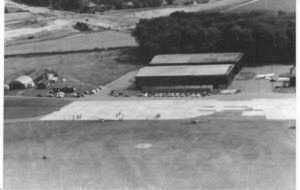 At this stage Booker was simply a grass aerodrome with little in the way of facilities, and it lay dormant until it was decided to open Number 21 Elementary Flying Training School (EFTS) there in June 1941, operated by Airwork and flying Tiger Moths (72 were flown in) and Miles Magisters. The four Bellman hangers were built. Designed by a Mr N S Bellman in 1936 they were intended to be temporary, although those at Booker are only now being replaced, more than 50 years later. Number 21 EFTS opened with 120 pupils on a seven week course - this was later extended to 11 weeks. In May 1942 training started for the Glider Pilot Regiment, (after the war Number 21 EFTS also took over responsibility for Army Glider Pilot and Air Observation Post elementary training). In July 1943 alone, 5576 hours were flown of which 442 were at night. Inevitably there were quite a few crashes and some fatalities. By 1955 the four wartime grass runways (north/south 3300 feet, north east/south west 3600 feet, east/west 2610 feet and south east/north west 2400 feet) had been joined by a 90 foot wide pierced steel planking hard runway 07/25 (2700 feet). There was also a VDF homer, Eureka (an early form of DME), approach and tower radio on 130.86 MHz. All lighting was portable. In August 1953 the University of London Air Squadron had resumed flying - at Booker, and the airfield also hosted the Manchester and Liverpool University Air Squadrons during 1954. The RAF continued to use the airfield for some time - Bomber Command Communications Flight was based at Booker until 1963. In 1965 Airways Aero Associations - the forerunner of the British Airways Flying Club - was formed with membership initially restricted to the then BEA and BOAC personnel and in 1967 Tony Gyselynck opened Wycombe Air Centre operating Condors, and later, Cessna 150s and 172s. Today British Airways operates the airfield under lease from Wycombe District Council and, through its subsidiary, Airways Aero Associations, provides the facilities such as ATC, rescue and fire fighting services, fuel, ground handling and lighting. The airfield is very active with the original fixed wing operations now joined by helicopter training provided by British Airways and Flightworks. Barry Abraham is an aviation historian and chairman of the Airfield Research Group. This article first appeared in Centreline, newsletter of Wycombe Air Centre.